Here is a carrier that can handle the higher loads. Erickson's Folding Cargo Carrier can get the job done. The carrier has an 18' foldable fencing on all sides. This helps make your load more secure. Made of black powder coated steel. The fencing folds down neatly when not in use or is easily removed. Maximum 500 lb. load limit. Use with a 2" receiver. Side fencing folds flat when to in use. Folding Trailer Hitch Cargo Carrier (500 lb. Capacity) Here is a carrier that can handle the higher loads. Erickson's Folding Cargo Carrier can get the job done. The carrier has an 18' foldable fencing on all sides. This helps make your load more secure. Made of black powder coated steel. The fencing folds down neatly when not in use or is easily removed. Maximum 500 lb. load limit. Use with a 2" receiver. 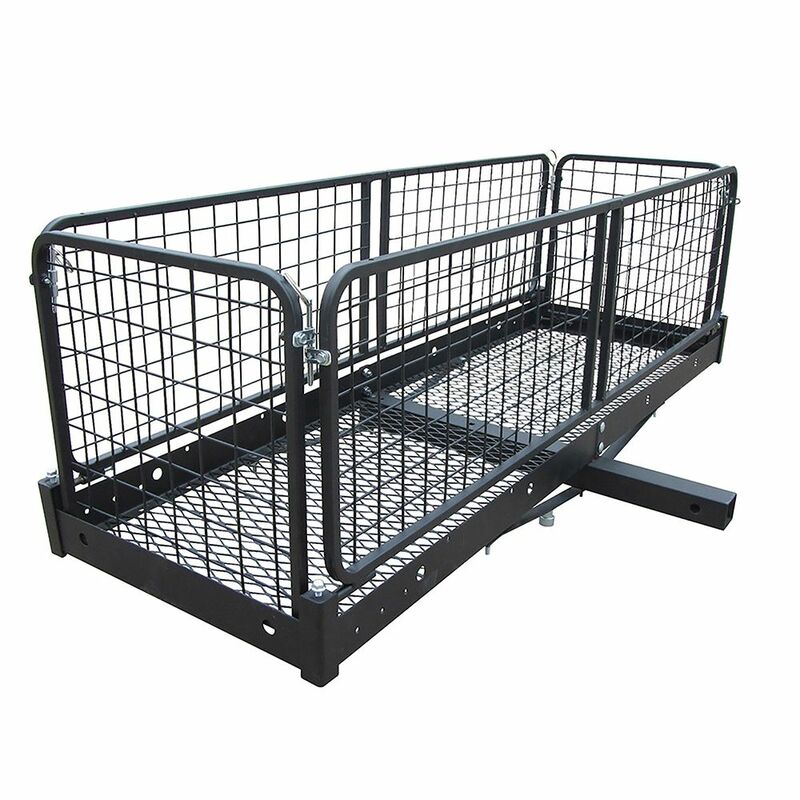 Folding Trailer Hitch Cargo Carrier (500 lb. Capacity) is rated 4.6 out of 5 by 75. Rated 5 out of 5 by Nancy from Have used it several times and love it. The... Have used it several times and love it. The only draw back is that we wish it would tilt up towards the back of car when not in use. But other than that, love it. Rated 2 out of 5 by 1bronx from not good to buy Very weak. It can not carre 500 lb. returned it after try. Rated 5 out of 5 by HomeDepotCustomer from I bought it to carry my gas cans to get... I bought it to carry my gas cans to get gas for my tractor and lawnmower. IT keeps the gas smell out of my car. Plus my wife didn’t like the idea of having gas inside in case we were in an accident. Perfect solution. Will this work for my 2010 Honda civic Honda coupe? I wanna use for luggage to travel to nova Scotia from Hamilton. If not this one can you recommend one? I had it with a converter to a 2 inch on my Chevy Orlando which is a crossover. It was sticking out and would touch the ground at times. I changed my car to a minivan and will try it again this summer. Built sturdy. Are the sides affixed to the bottom or do they have to be fastened to keep someone from just lifting it off and taking your luggage. Also..... do I need tail lights with this if I put in a solid 60&rdquo;x24&rdquo;x24&rdquo; cargo bag? They are fixed but can be easily take off it has been a good purchase for me. Hi, what are the inside dimensions? The inside of Carrier part # 07495 is 19.25&quot; x 57.5: x 5.5&quot;. This is the Black carrier. I have a 2016 Jeep Wrangler, will this product work with the tire on the back? Good Day Brad: The carrier will not work with a tire mounted on the back of your vehicle. When the carrier is empty, does it interfere with opening a van hatch? Does it fold up so you can drop the cargo off and do tourist things or do you need to remove it completely? Deborah: I'm not sure which unit you are asking about so here is the answer for both 500 lb. units. Part # 07495 will allow you to open a hatch. This unit does fold up to the vehicle. If used for long periods of time it should be take off the vehicle. Part # 07496 will allow a hatch to be opened if the fencing is folded down. This unit does NOT fold up to the vehicle and should be removed when not in use. Can this carry upto 4 bikes? If so, is there a vertical accessory that mounts on the reck to secure the bike to? Does mounting this on the back of an RV trailer void the warranty? Thanks! This carrier was not designed for bikes, so we have no accessories to mount bikes. The carrier can be used on a RV as long as the weight requirements are met. No need to install lights or wiring unless you are covering your vehicle lights. The hitch is 7' from basket to pinhole. Once this hitch mount carrier is installed on your hitch and it happens to cover your license plate, is this permitable for driving without getting a ticket? What can be done if it is not allowable? To the best of our knowledge they are legal. We have never had a report of any issues. We do suggest that it should be removed when not in use.